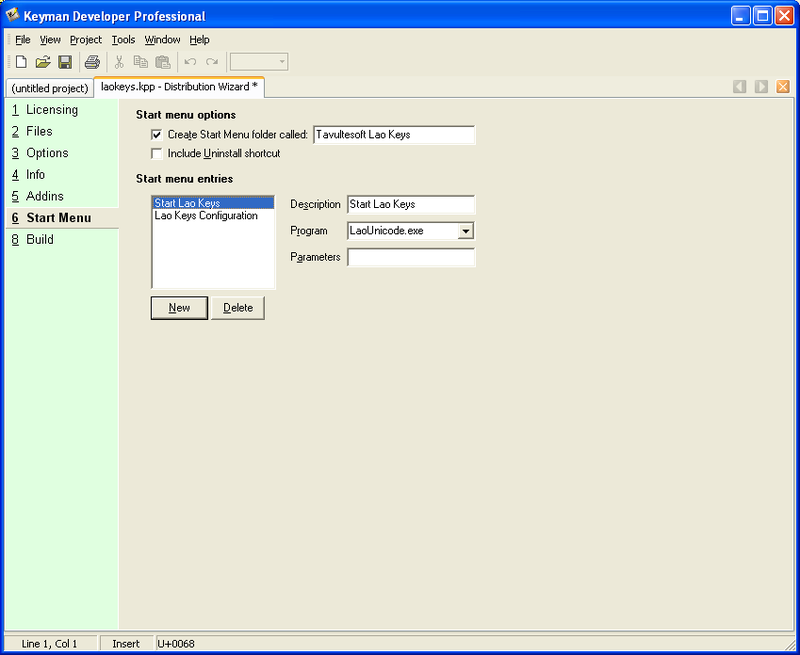 I am going to take you through the steps to create a shareware product in Keyman Developer 7 Beta 1. Much of the user interface will change with Beta 2 and no doubt some of the steps will be restructured somewhat, but the concepts should remain fairly similar. Before you start, make sure you have a keyboard, and a package with documentation and fonts. I won’t cover any of that in this example. 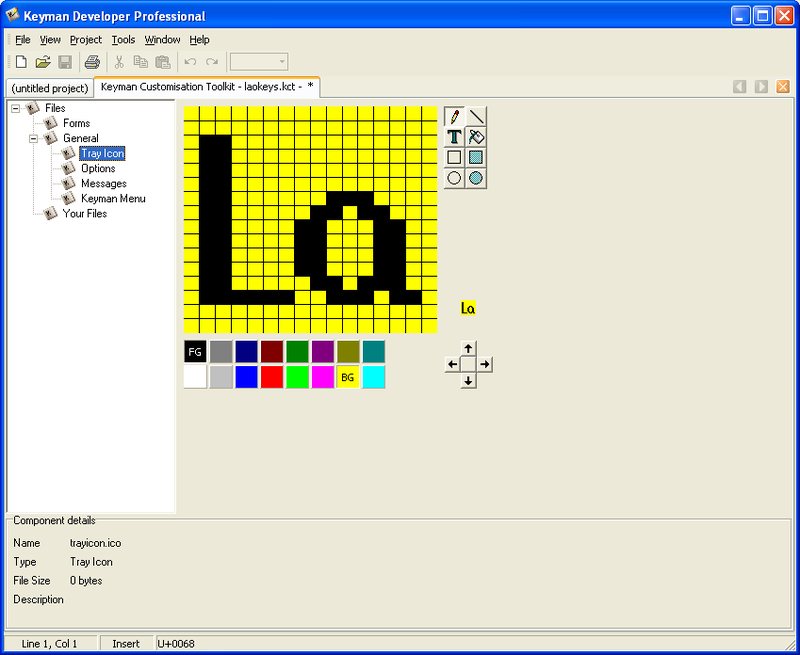 I am assuming that you are familiar with Keyman Developer 6 and Keyman 6.
keyman.exe – The tray icon application and background program. 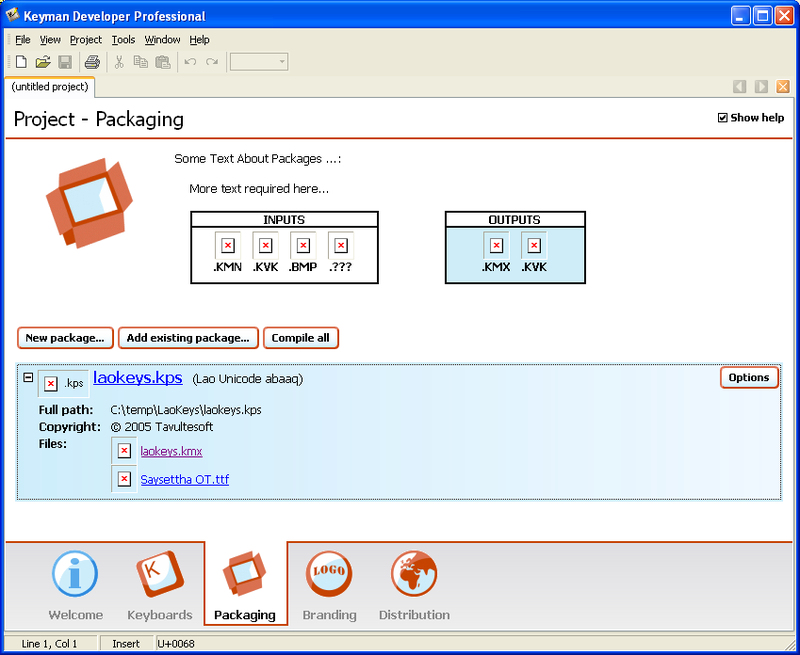 The idea is that you can replace the files in Keyman Desktop with your own product files. 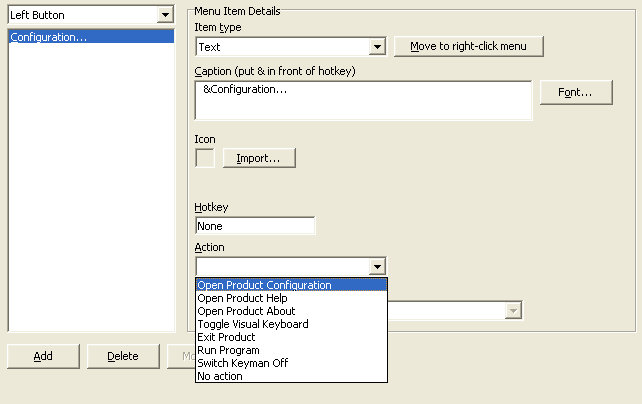 You can choose to keep the Keyman Configuration user interface, or you can replace it entirely with your own interface. In this example we will replace the user interface entirely. 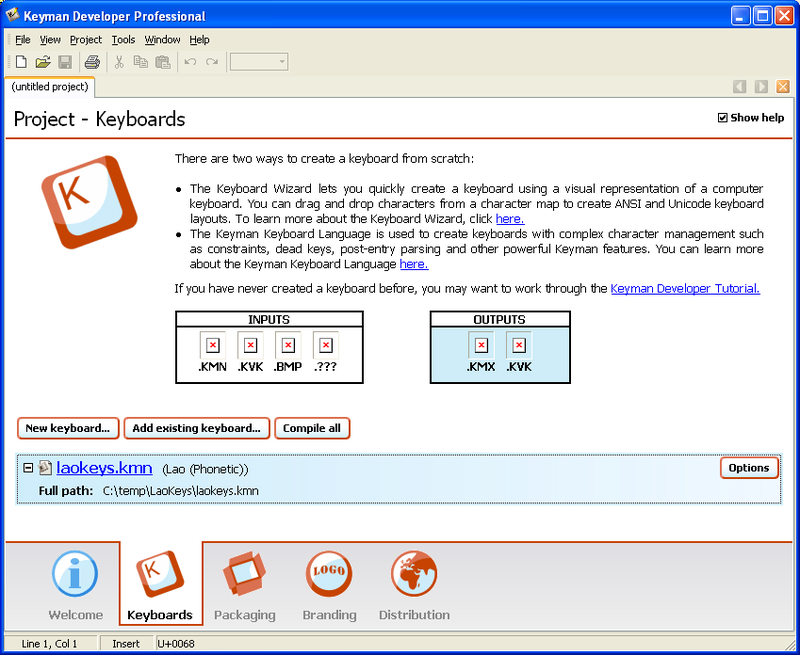 Step 1: start Keyman Developer 7 and create a new project. Add your keyboards and packages to the project. Don’t forget to compile your keyboards and packages. This will generate normal .kmx and .kmp files. 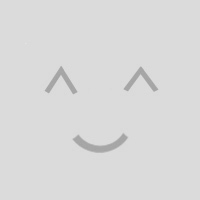 Step 2.1: Create your default task bar icon for the branding file. Shareware: You define the length of the evaluation – there is no up-front licensing cost for Keyman, and you can start selling the product immediately through the Tavultesoft online store. The online store automatically manages the licensing for Keyman and product activation. 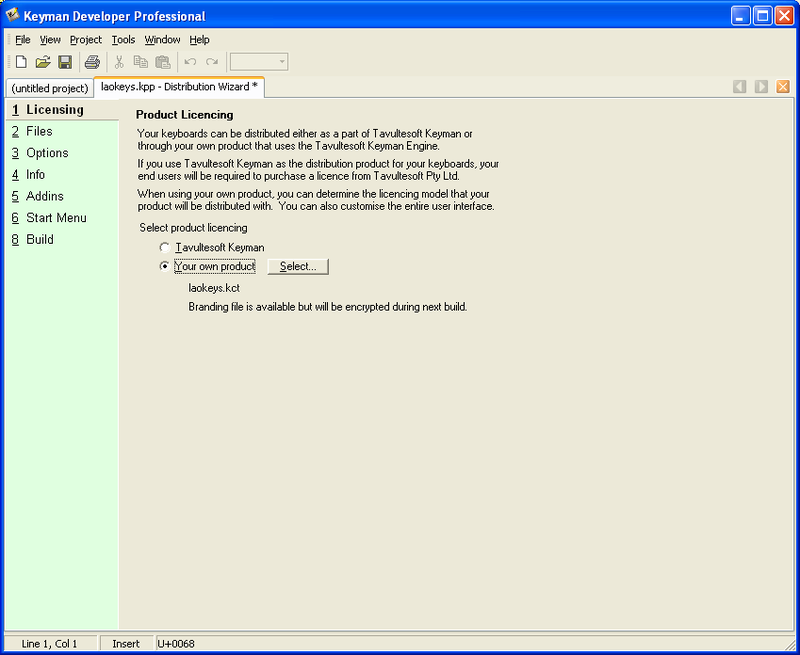 Freeware: You purchase a license to distribute Keyman with your product as freeware to all users – at no cost to them. You cannot sell your product with this model but must make it freely available to all users. 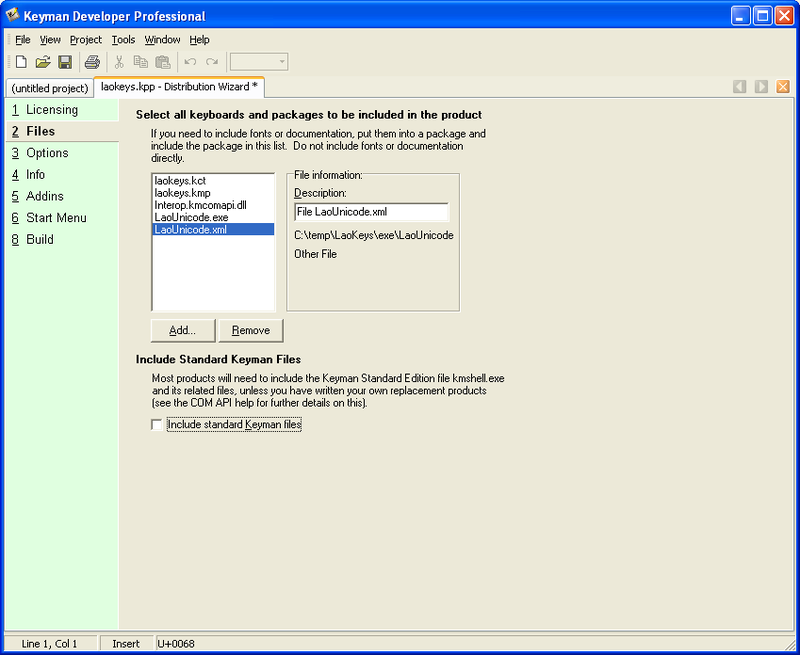 No product activation is included in a freeware product. Global: You purchase a license to distribute Keyman with your product and you have full control over how you manage the product. Product activation is not included in this model. You do not need to update any of the messages from Keyman Configuration if you are using your own user interface for the product. 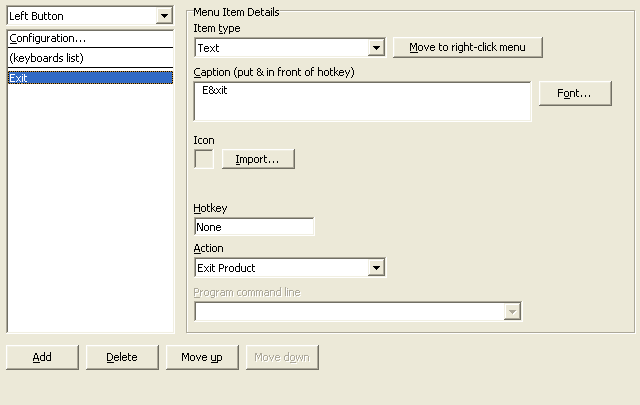 I have unticked the "Include Standard Keyman Files" checkbox as we are not using the Keyman Configuration user interface. Please note: a bug in beta 1 means that you need to add the redistributable file insthelp.exe into the installer if you do not include Standard Keyman files. insthelp.exe is available in the C:Program FilesTavultesoftKeyman DeveloperRedist folder. 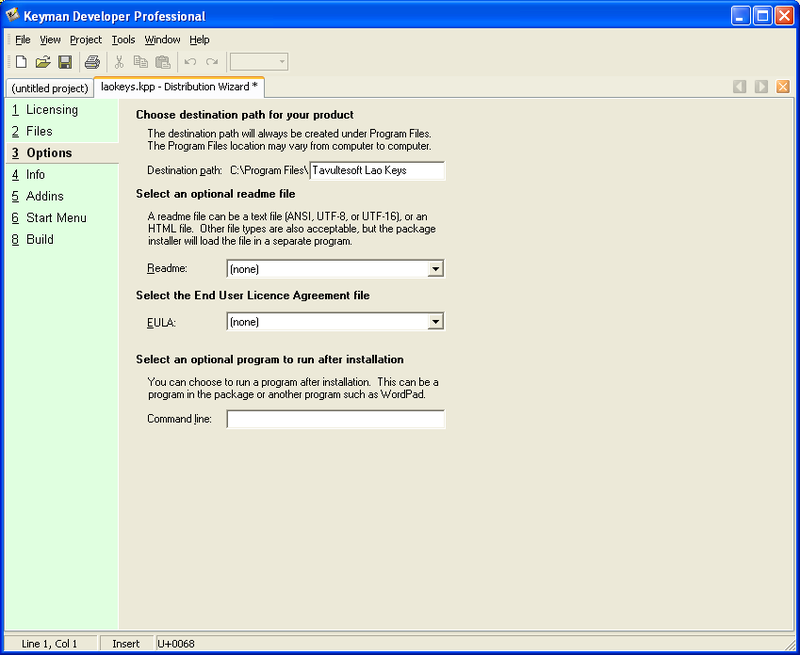 Candle and light are part of the WiX toolkit that we use for creating Windows Installer MSI files. During this process, you will probably be asked for your tavultesoft.com login details. Keyman Developer requires access to online services from tavultesoft.com to encrypt your keyboard and setup product activation. Walkthrough the Tavultesoft Online product management website – product management, purchasing licenses, activating end user licenses and more. Don’t forget – if you encounter any bugs when following through this, create an issue!